We are going to leave this summer, and that motivates us to do fast sight-seeing trips in Korea. I took a day of on Friday, and Christina and I prepared for, well, driving a lot. We made some pictures, enjoy them. Before we started we went to Yde's school, they had open day because the whole week was a 'senses' week. Touching, smelling, seeing things. Yde proudly showed us what he learned that week. Touch and feel, what is it? 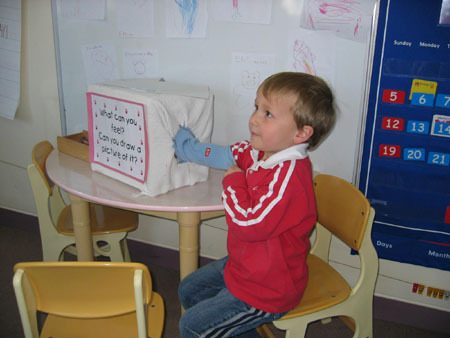 Yde was very proud of what he learned, and he wanted to show everything in his classroom. If you look better at the second picture you might think his classroom is quite dirty. 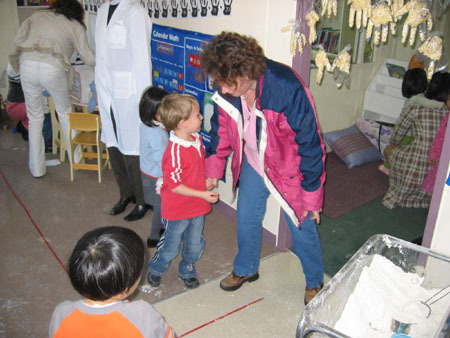 Well, it's flour on the floor, they also needed to touch and feel that stuff. It made everyone a little bit white. This was one of the best parts of the trip. A place not mentioned on our map as 'place of scenic beauty' (makes us normally laugh because there is really nothing to see). 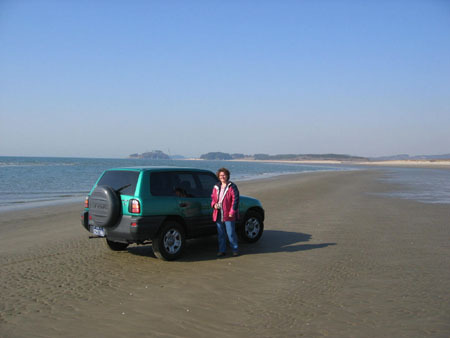 Just a deserted beach and you can take your car and drive on the beach. It is located ****** (sorry, I will write it tommorow, map is still in the car) and worth visiting. Be aware of the big difference in tides, don't walk around for a couple of hours, your car will be flushed away. After the west coast and that nice beach we decided to take the Olympic Expressway (Tollway) to Daegu. We wanted to drive along both coastlines, West and East. Don't be fooled by the fact that you pay toll. It's an expressway, not a highway, only two lanes!. But still one of the fastest ways to make a crossover if you are somewhere in the middle of South Korea. Upon arrival in Daegu we searched for a motel. We ended up with a hotel. The difference was just the H. The room was maybe even worse (sheets didn't look very clean) than the rooms in an average 'love' motel. But we took it, it was in Daegu, close to the Daegu tower and it was cheap. 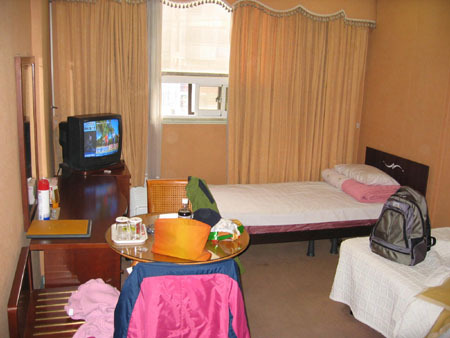 We paid 30.000 won, around 30 dollars for the room. Because of the 'Korean' experience of this hotel including the Kim Chi smell we immediately started to explore the neighbourhoud. 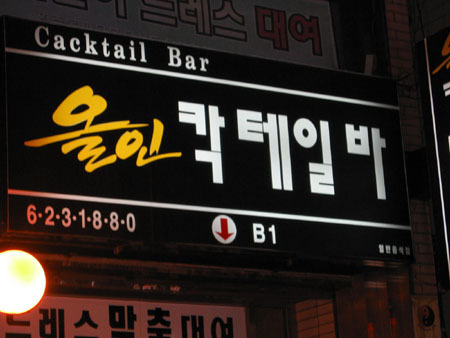 One of the bars we did not wanted to investigate was this cAcktail bar. No idea what it means. We also saw a sHcool and many other wrongly written things. Probably not the most important thing for shop owners in Daegu. 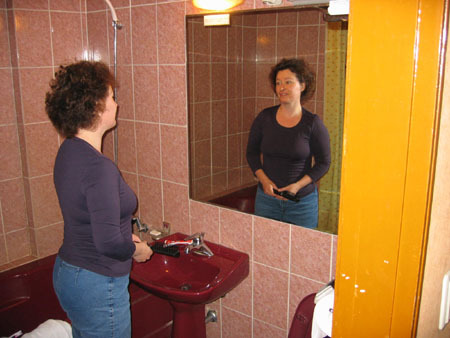 And what to think of a deep red toilet and bath tub? Furthermore interesting, the automatic air refresher, every 5 minutes a cloud of toilet spray in your room. We managed to switch it off. Today we woke up around 09.00, after a nutricious breakfast at the McDonald's (bweuh) we took the highway to *****. The road along the East cost was our next destination today. 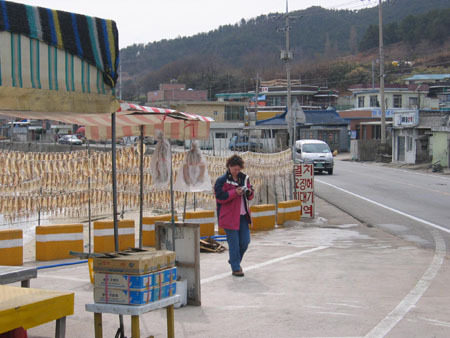 We found it without any problem and we also found the drying squid. I was quite happy to find it because I saw these pictures in the Lonely Planet guide a couple of years ago but I never saw it for real. They hang that stuff everywhere. 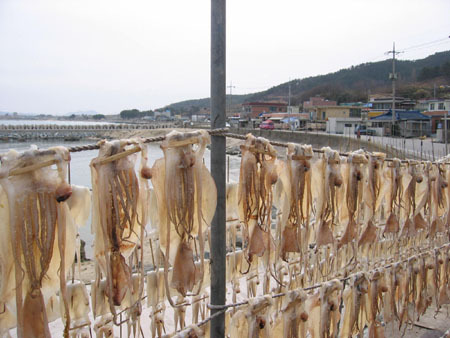 Drying squid, the taste is fishy and salty, you chew on it like chewing gum, the only difference is developing a very bad case off mouth breath. Christina and squid, she did not like the smell too much. And these are smoked in gasoline fumes, probably the best way to camouflage the original taste. Road 7 along the East coast has some places of 'scenic beauty'. 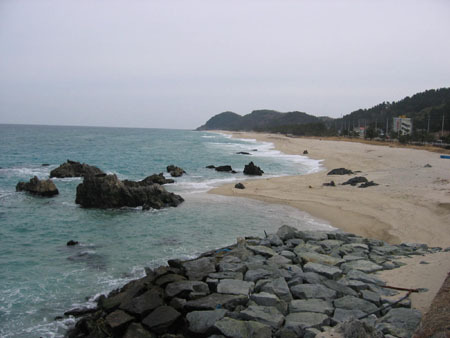 Beaches, rocks, hills, harbours and small villages. Just one of the many beaches we saw today. Road 7, or road 20, you can take each one and find nice places. 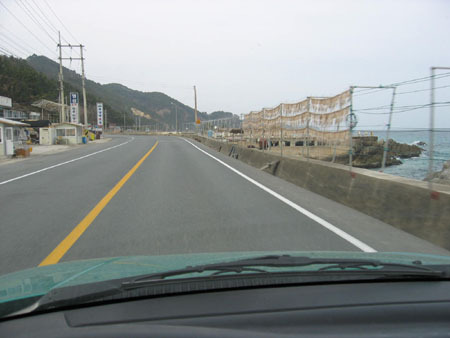 If you live in Korea you should try to drive this road at least once. More hills with some snow. 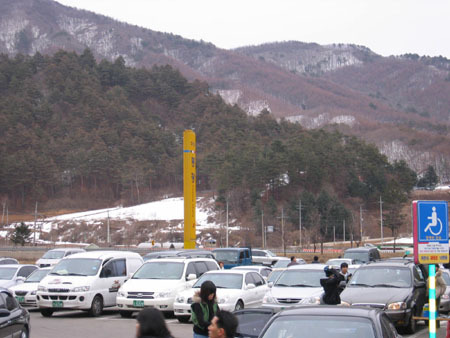 The last part was a problem, traffic jam and Seoul still 88 kilometers away. It reminded us of our reasons not to go outside the city during weekends. It's always a problem to go back to Seoul on a Saturday or Sunday. 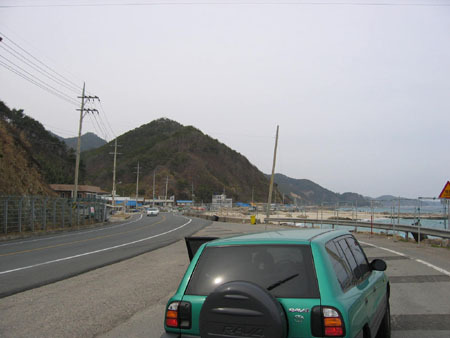 To avoid 88 kilometers of traffic jam we took some other small roads to reach Seoul. This worked more or less, we managed to approach Seoul to an astonishing 30 Kilometers before traffic jams started again. 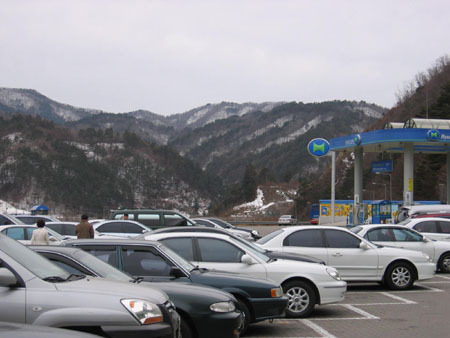 I guess we lost 2 to 3 hours in traffic jam but at least it is a genuine part of the sight seeing experience in Korea.